Yossy Arefi from Apt. 2B Baking Co. shares dessert projects that demand a little extra time and effort. Because your weekends should always be sweet. Today: With two layers of light, yeasted cake, a sticky almond topping, and a pastry cream filling, this will be the best bee sting you've ever had. 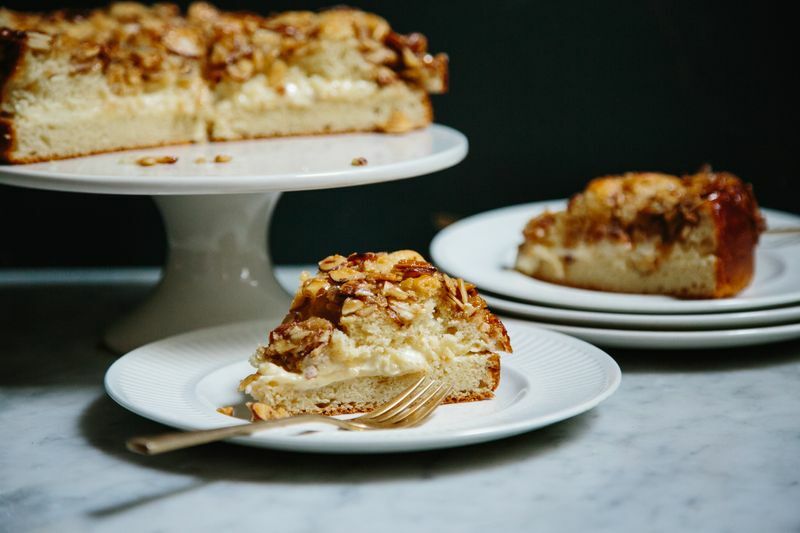 When I set out to make this Bee Sting Cake—Bienenstich, for you German speakers out there—I searched around quite a bit for the right recipe. The main components of this treat are pretty simple: yeasted cake batter or dough that’s topped with sticky, honeyed almonds and a pastry cream filling. But, as we all know, sometimes simple recipes are the trickiest to get right. When I saw Deb from Smitten Kitchen’s exhaustive Beinenstich research, however, I knew I could trust her recipe. It starts with a base that is more of a cake batter than a bread dough, which makes for layers that are more light and fluffy than dense. 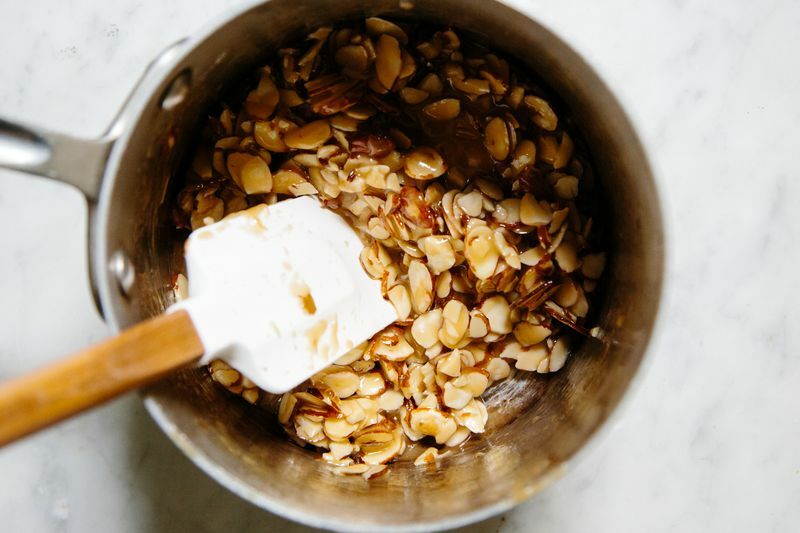 The sticky almond topping is held together with sugar and honey, and seasoned with a hefty pinch of salt, which cuts through the richness—I’d argue it's the most important ingredient. The layers of cake are filled with pastry cream that's very thick to ensure that it doesn’t just fall out of the sides of the cake when sliced. The result is a slightly sweet cake that is equally great as a celebratory dessert or an indulgent breakfast treat. To make the cake, combine the flour, sugar, yeast, and salt in a large bowl and stir to combine. Make a well in the center and add the milk, eggs, and butter. Stir the batter together until it is well combined and cohesive. The batter will look somewhere between a loose bread dough and a thick cake batter. Cover the bowl with plastic wrap and let it rise in a draft-free spot for an hour. The mixture will not quite double in size. Butter a 9-inch cake pan and line it with parchment paper. Stir the batter a few times to deflate it slightly, then scrape it into the prepared pan and spread it until it more or less fills the bottom of the pan. Cover again with plastic wrap and set aside for another 30 minutes. 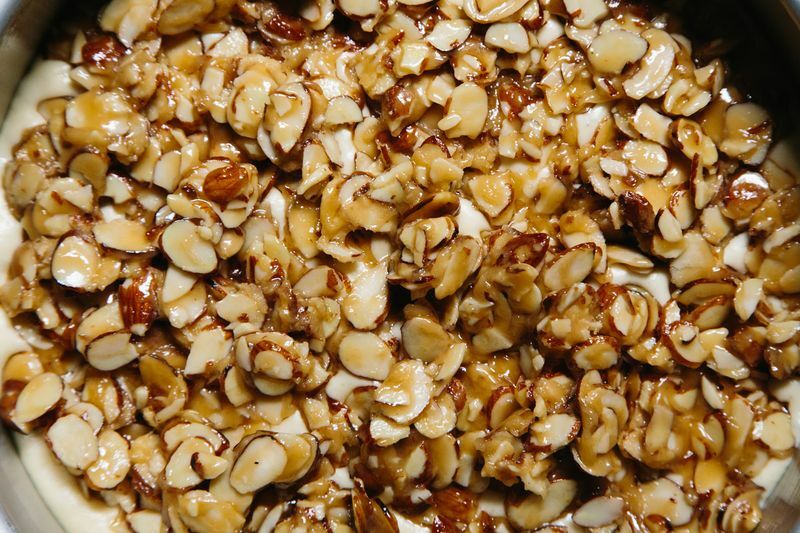 While the cake is rising again preheat the oven to 350° F and make the honey-almond topping. In a medium saucepan over medium heat, heat the butter, sugar, honey, cream, and salt, stirring occasionally until the butter is melted. Bring to a simmer and let boil for 3 to 5 minutes, until the mixture becomes a shade darker (it should go from a yellowish tone to a light beige), stirring frequently. Stir in the almonds. The mixture will be very thick and sticky. Set it aside to cool slightly. Once the cake has risen and the honey almond topping has cooled slightly, use a spoon to place small amounts of the topping over the cake batter. Make sure to cover the entire top of the cake, all of the way to the edges. Bake the cake for 20 to 25 minutes, until the top is golden and a toothpick inserted into the center comes out clean. Transfer to a cooling rack and let it sit in the pan for 10 minutes. After 10 minutes, run a knife along the outside of the cake and invert it onto a cooling rack. Invert it back onto another rack to cool completely. While the cake is cooling, make the pastry cream. In a medium saucepan, warm the milk, vanilla bean pod, and vanilla bean seeds until it comes to a simmer. Set aside to steep for 30 minutes. In a medium bowl, whisk together the egg yolks, sugar, cornstarch, and salt until pale yellow and smooth. After the milk has steeped, remove the vanilla bean pod, rewarm it slightly onthe stove, then whisk it into the egg mixture. Pour the mixture back into the saucepan and cook over medium-low heat, stirring constantly, until it begins to bubble. Cook the mixture for 1 full minute, then take the pan off the heat and whisk in the butter. Transfer the cream to a bowl, then press a length of plastic wrap on the surface. Refrigerate until completely cool. When the cake and pastry cream are completely cooled, assemble the cake. Slice the cake in half horizontally. Stir the pastry cream to loosen it slightly, then spread it over the bottom of the cake. 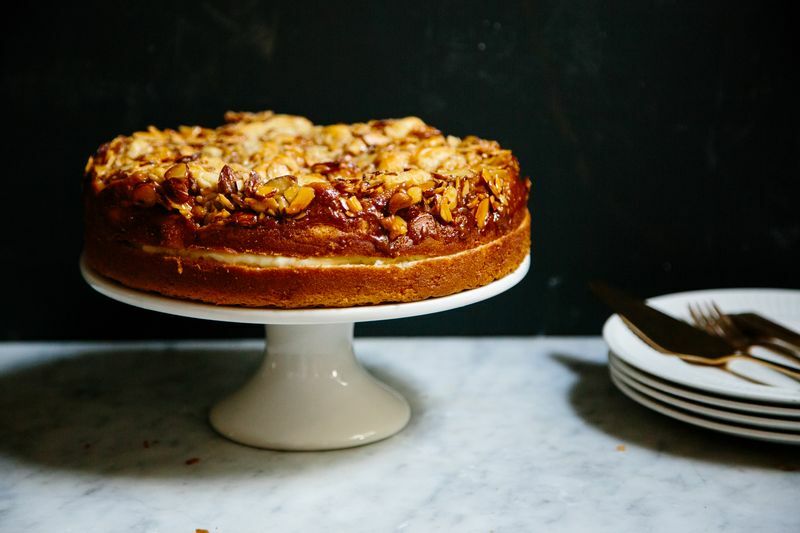 Top with the almond-crusted layer and serve immediately. Store leftover cake, covered, in the refrigerator for up to 3 days. My ancestors brought this recipe with them from Switzerland to America. I recall our family recipe using more butter, but I'm excited to try one that doesn't call for as much butter! Also, we have always spread delicious raspberry jam inside before adding the custard in between the layers. I think it makes a perfect balance of flavors! Can I make the pastry cream in advance? How many days will it keep in the frig? Thanks! What a beautiful cake! Can't wait to make it. I have been looking for the perfect bienstitch cake recipe forever. THANK YOU Yossy. This is indeed fabulous, and very close to the primo version sold at the Raleigh NC Farmers' Market, which is to die for. Now if only someone out there would figure out how to make Bostock......Are you listening, Deb Smitten? I'm going to write about Bostock! Very soon!! Thank you! Thank you! Waiting anxiously! I made this from Deb's recipe one or two years ago, and it was SO fabulous. I never really understood why it wasn't raved about on the internet... and now it shall be! Cannot wait to dispatch the three cakes we already have on our counter into tummies so I can make this again!